Garage door springs are one of the most essential components of a garage door. They do all the heavy lifting and bear high tension every time the door opens or shuts. The life expectancy of garage door springs is measured in cycles not years. One single opening and closing sequence is equivalent to one cycle. Meaning, the more you use the door, the shorted the life span of the springs. There are mainly two types of springs that are used in a garage door – torsion springs & extension springs. Modern garage doors have torsion springs mounted above the door. These galvanized springs are made of soft steel which over the time loses its strength. That’s why, non-galvanized springs are a better option as they are made of hardened spring steel. But, even they break eventually, requiring a garage door spring replacement service in Calgary. Extension springs are found on older doors and are mounted above the door tracks or on either side. They raise or lower the door by stretching and contracting, allowing smooth operation. These springs cannot withstand extreme climatic conditions, such as hurricane and force winds. Thus, it is advised to inspect the springs often to see the potential signs of damage before they cause any damage to you and your property. At, Gulliver Garage Doors Ltd., our adroit technicians specialize in garage door spring replacement and installation services. We have a team of highly skilled professionals who have the industries best experience replacing broken springs on garage doors. Both torsion and extension springs can be extremely dangerous. Since they are wound very tightly, they can cause a lot of damage as well as bodily injury if they break. Gulliver Garage Doors Ltd has been replacing and installing garage door springs in the Calgary area for the past many years. We know how to get the job done right the first time. Our technicians will arrive at your place to check the condition of your springs and will work to your satisfaction. 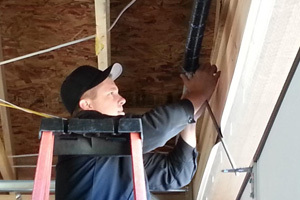 At Gulliver, customer satisfaction is our top priority and we will ensure your garage door spring repair or replacement job is completed in a timely and efficient manner.